We are happy to say that Dirk Ivens & The Juggernauts are invited the play at yet another edition of the already renowned Out Of Line Weekender Festival in Berlin city. 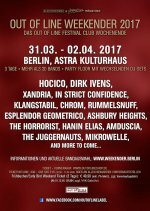 Hocico, Xandria, Klangstabil, In Strict Confidence, CHROM, Rummelsnuff, Ashbury Heights, Esplendor Geometrico, The Horrorist, Hanin Elias, Amduscia, Mikrowelle and many more! 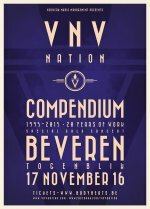 Last 50 tickets for VNV NATION - Compendium Tour show on November 17th @ Togenblik (Beveren, B) on sale now! The evening with VNV Nation: In celebration of the 20th Anniversary of the first VNV Nation album, and where the group will be celebrating with a 3-hour during concert is about to sell out in the next hours/days. On this show VNV Nation will take their fans through the complete history of the band, covering songs from every album and single, along with rarities and last but not least with a meet and greet after the concert. So if you don't have your tickets yet - Hurry up and click the link below to order! 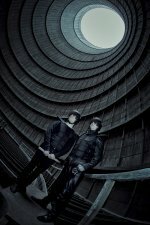 'Purge' video by The Juggernauts online! 'PURGE' the first DIY video from our new album 'The Juggernauts Are Coming' is online! Two New-Wave Club Classic artists on the same stage!? Yes! We managed to put two of the most legendary electronic music pioneer bands on our stage on October 23rd. Some of you might have forgotten who CRASH COURSE IN SCIENCE and SEVERED HEADS are. But rest asure the chance you danced to their music is more than likely! Google or click the link below and be surprised! Since 1979 Australian (industrial) music pioneers SEVERED HEADS has thumped out a noisy disco sound that's inspired dance styles from EBM to Chicago House. Back in '79 there were no samplers, no computers, and the Severed Heads style grew around the same tape recorders and oscillators that fueled the avant garde music of the 20th century. Their exact genre is impossible to define - club singles like Dead Eyes Opened and Greater Reward jostle with aggressive noise-scapes and psychedelic virtual reality installations. Although contemporaries with ‘old school’ acts like Kraftwerk and Yello, Severed Heads continue to create and mutate ‘new school’ sounds. A Severed Heads show is somewhere between an arcade game and a live gig. The big screen and the big sound combine the cinematic and the ecstatic. "We are a balance between the old and new", explains head Head, Tom Ellard. "Too much nostalgia will make you fat, but too much newness frightens people. For us it's OK - we've reached the point where ten years or ten minutes doesn't matter anymore - we're timeless". 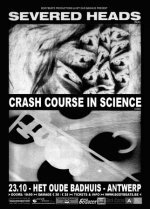 CRASH COURSE IN SCIENCE (CCIS) is an legendary electronic musical group that was also formed in 1979. The band was formed as a way to explore performance art and music, which the members desperately needed to express. Choosing toy instruments and live drums out of necessity, CCIS began to experiment with a series of recording devices. The toy instruments gave way to crude drum machines and 'Frankenstein' type-homemade instruments. As a result, CCIS came upon a sound they could call their own. Their most know artefact is probably 'Signals From Pier Thirteen' which was released in the USA and UK/Europe in 1981. The songs 'Cardboard Lamb' and 'Flying Turns' quickly became club favorites during the early 80's. This record has been regarded as influential to the techno industrial genres and was an early inception of what is now known as the ‘electro’ sound. After numerous re-releases the original 12" still highly sought after by collectors and fans today. An remarkable and Interesting detail, the BodyBeats organization were also responsible for BOTH bands resurrection as they invited SEVERED HEAD to reboot for their fourth BIMFEST in 2005 as they did with CRASH COURSE IN SCIENCE for their eight edition of BIMFEST! An evening With VNV Nation : In celebration of the 20th Anniversary of the first VNV Nation album, the group is celebrating with a series of gala 3-hour concerts. The shows will take fans through history of the band, covering songs from every album and single, along with rarities, different setlists at all shows, and a meet and greet after the concert. Be aware that the pre-sale has begun and ticket are very limited!